Among the many things that CNN would probably like to slap its own “FAKE NEWS” label over are the recent accusations that it essentially blackmailed someone over a meme. But according to Deadline, that’s where the cable news outlet finds itself in the wake of Independence Day celebrations—because, after all, there’s nothing more patriotic (sorry, modern day patriotic) than sharing a 10-year-old video about a fake fight. 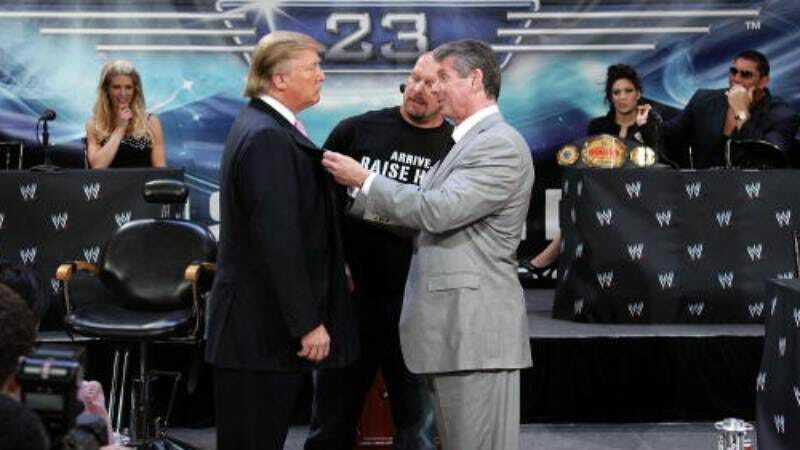 After Trump shared the meme—in which he is shown flinging Vince McMahon-as-CNN around—the cable news network’s KFile investigative unit didn’t just assume that the man who can’t spell “conference” altered the video himself to replace McMahon’s overly-tanned mug with the CNN logo. The journalists started looking into the origin of the meme/gif/what have you, and landed on Redditor HanAssholeSolo, who first posted it in a pro-Trump subreddit. The KFile team—namely, Andrew Kaczynski—kept digging, though, and reportedly learned who HanAssholeSolo is. Ultimately, CNN says it decided not to reveal HAS’ true identity, though it indicated that if the Redditor continued posting questionable things, it might release the info anyway. Here’s where things get confusing for some Twitter users: These reports started circulating around the time HAS started deleting old posts—including a graphic in which they posted a Star of David next to headshots of CNN journalists—and posted an apology in which they denied being the kind of person they obviously are. For clarity’s sake, Kaczysnki has stated online that the apology was published before his first conversation with the Redditor, who asked the reporter not to reveal his identity. But the events occurred closely enough in the chronology for some people, including Trump’s son, to make the leap to extortion. If we haven’t lost you to the newswire about Katy Perry and koalas yet, CNN has now issued its own statement about the dubious blackmail allegations (and hashtag). Per the network, no deal was ever struck with the person behind that Reddit account. CNN decided not to publish the name of the Reddit under out of concern for his safety. Any assertion that the network blackmailed or coerced him is false. The user, who is an adult male, is not a 15-year-old boy, apologized and deleted his account before ever speaking with our reporter. CNN made made any deal, of any kind with the user. In fact, CNN included its decision to withhold the user’s identity in an effort to be completely transparent that there was no deal. Kaczynski has iterated all this info on his Twitter account, including the fact that the subject of this brief investigation is a middle-aged man, and not a 15-year-old boy. This hasn’t slowed the #CNNBlackmail momentum, though. Ted Cruz, who only gets out of bed to find 10,000 ways to make things worse, has already picked up the call.